Cold Steel Emperor Katana Sword | BUDK.com - Knives & Swords At The Lowest Prices! 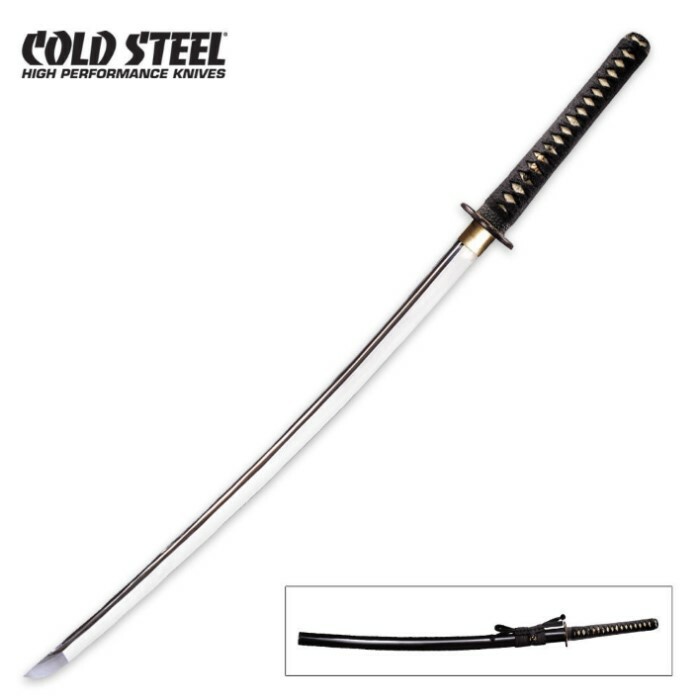 Cold Steel's Imperial katana is one of the finest and most traditional looking swords that can possibly be found. This katana measures 40 3/4" overall and features a fully sharpened 29 3/8" blade of 1055 carbon steel. The carefully hand polished blade is designed with a blood groove that has a distinctive mirror polish applied to it. The hilt is covered in ray skin and tightly wrapped in the traditional style with black silk braid cord. The guard, pommel, and collar are all crafted in nickel-silver brass. This katana also includes a black lacquered wood sheath and blue violet cover bag. This fully functional sword will quickly become a prized part of your collection! Cold Steel, 88K. Too high of a price for a low grade carbon steel katana. Unbelievable sword, and can't beat the price. Rather than the older model that had the listed iron guard and fittings, I received one of the extremely handsome newer swords that feature nickel-silver brass for those parts. One of these swords would run you $874 if you bought directly from Cold Steel, making this an almost $1,000 katana that you can have for less than $500. Quality is of course top notch. The entire sword is well balanced, extremely sharp and well polished, and all pieces are put together exceptionally well. There's not a rattle to be found. The weight is good, and it's simply a joy to swing. Anyone who collects should jump on this deal, you're getting a very high end Cold Steel katana for what is effectively 50% off. First off i love this sword i just recieved it today and i have never seen such a more beautiful sword before, a bit pricey but trust me you will never go wrong with this baby, razor sharp good weight to it. my first sword as well but a very good start for my collection hopefully ill be adding the wakisashi soon to acompany it. Peace!